Teaching Statement | Farina King, Ph.D.
My uncle, Albert Smith, inspired me to teach by respecting all learners and their abilities to build themselves, their families and communities. He drew me in with his stories of memorizing elaborate codes and working through exchanges of languages while under fire in combat zones as a Navajo Code Talker. He recognized the complexities of the mind, referring to it as “a great computer” with infinite capabilities. His teachings shaped my identity as a Native American scholar, which permeates my interactions with students. Because my teaching paradigm stems from the conceptualization of educational relationships as a community of scholars, including faculty, staff, students, and community members, I refer to students primarily as fellow “learners.” The indigenous metaphor of the ear of corn resonates with me, which Gregory Cajete of the Santa Clara Pueblo explained in a public lecture to define “community.” Every corn kernel is valuable as an individual piece, but the kernels support each other in the rows and patterns of the plant. Expanding on Cajete’s points, I envision how learners sustain one another and connect different groups of people. As an instructor, I guide learners towards their full potential as individuals and community members. A hybridization of various cultural pedagogical practices shapes my teaching. My fluency in different languages supported my research and studies abroad in Senegal, France, and Brazil, where I connected with diverse peoples. Languages and oral traditions encapsulate epistemologies, worldviews, and knowledge systems, which I introduce and explain to learners in my classes. In and outside of the classroom, I share knowledge of my Diné ancestry and history, as I learn and include perspectives of other peoples. Students appreciate my abilities to relate this background to my courses, such as one who valued the “many insights pulled from [my] diverse travels.” My focus on Native American and African studies, for instance, distinguish my pedagogy, as students join me in search of various viewpoints relating to overarching narratives of colonialism and power. Two major goals in my research and teaching are first, in regards to the people being studied, to support indigenous sovereignty and second, to provide larger and varied publics with knowledge about underrepresented peoples such as Native Americans and Africans. Engaged student learning and service-learning reinforce my curriculum of the corn metaphor, which promotes the reciprocity between student and community support. 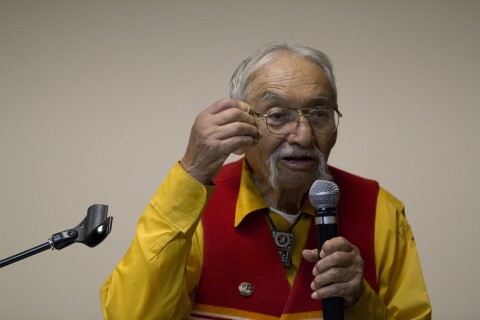 Learners in one of my classes, for example, practiced oral history methodologies, while working in committees to prepare and host a public guest lecture by my uncle Albert, a Navajo Code Talker. Students engaged in service, scholarship, and professional development, as they interviewed and conversed with veterans such as Uncle Albert and Rachel Kirby who served in the Iraq War to preserve their memories and oral histories through the Utah Valley University (UVU) library and archives. Uncle Albert has since passed away, making these oral histories and the public event that my students prepared irreplaceable. At the open presentation, attendees thanked my students and me for providing them with the opportunity to learn from Uncle Albert. Students add to their résumé in my classes, as they fulfill college prerequisites and service goals. In the fall of 2017, my class created a portfolio of exhibit designs for the Eufaula Area Museum. I organized a class excursion to Eufaula with a guided tour and interaction with local community leaders. The students also prepared oral presentations for a public symposium, which scholars and professionals attended. Some of my students have decided to apply for internships at the National Museum of the American Indian because of their experiences with the service-learning project. Students in my classes learn to be accountable not only to me as their instructor but also to larger communities, as they gain hands-on experiences in real-world career skills and academic applications. My colleagues and other instructors have followed the curriculum that I developed, and I continue to exchange ideas, especially of Native American oral history projects and service-learning, in academic and professional circles throughout the country. Between spring and fall 2018, my classes launched a digital Mapping Tahlequah History project. This project constitutes the research component of the courses, which allow students to apply their learning in historical interpretation and design to a digital mapping history project that serves the public by contributing to accessible analyses of local histories relating to historic sites in Tahlequah, Oklahoma. We are using historical analysis and contextualization, recognizing perspectives and interpretations, in a digital mapping history project that serves the public by contributing to accessible analysis of Tahlequah histories. Students produce individual brief entries and content for a developing online thematic research collection, Mapping Tahlequah History, that features local histories and historical perspectives through reading place and primary sources found through the NSU John Vaughan Library Special Collections and Archives. I further promote engaged learning by involving students in the teaching and encouraging them to explore ideas and discuss them with each other. I highlight how lessons from the past and various issues of ethnic, racial, and gender studies are relevant and can change lives and communities for the better. As evaluations show, students can identify course goals, appreciate guest lectures, and learn from the “constructive feedback” that I provide. My syllabus and curriculum demonstrate the purposes of each course activity and assignment. As a research assistant for the American Historical Association History Tuning Project, I conducted interviews and surveyed teaching materials of different history faculty. The project, under the guidance of Catherine O’Donnell and Mark Tebeau, taught me how to direct courses and assignments towards beneficial outcomes for students in their efforts to attain careers and strengthen societies. According to student feedback, learners in my classes have sensed how “engaged” and “involved” I am with “each of [my students].” They know I “genuinely care about each student’s success,” which inspires them to excel in their life pathways. In addition to the Tuning Project, I have participated in several teaching improvement programs such as the UVU Teaching Academy, Service-learning Circle, the Students Consulting on Teaching (SCOT), Dartmouth Center for the Advancement of Learning (DCAL), and NSU Center for Teaching and Learning. My service on the ASU Graduate and Professional Student Association (GPSA) teaching awards committees and NSU Faculty Council has also exposed me to exemplary relationships between instructors and students in higher education. I also became the inaugural director of the Center for Indigenous Community Engagement at NSU, which supported interconnections between teaching, research, and community. I continue to develop skills to facilitate learner-centered and engaged experiences for students that prepare them for real-world situations, while integrating online tools through systems such as Canvas, Blackboard, Prezi, and Turning Technologies. I am experimenting with digital humanities projects that share the productivity of my classes with wider audiences by developing my own website with class highlights. Faculty, staff, students, and communities have the ability to collaborate through our exchanges, relationships, and practices of interdisciplinary methodologies such as oral history and understanding different worldviews from the past and present. My teaching demonstrates how to bridge diverse students, communities, and scholars, connecting academia and our “great computers” through the design of the corn metaphor, with the world to ignite positive changes.